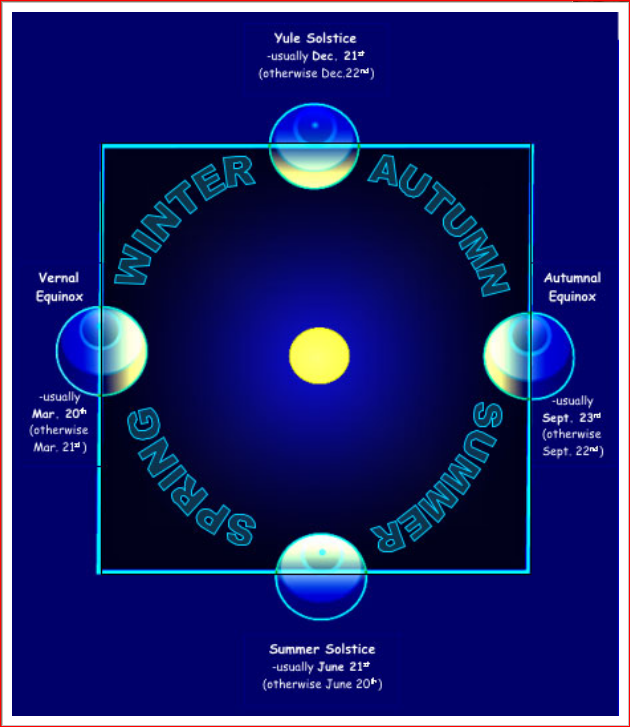 This diagram shows the position of the Earth, in relation to the Sun, at the time of the Autumnal Equinox, as well as the other solstices and equinox of the year. ©1999, Eric G. Canali, former Floor Operations Manager of Pittsburgh's original Buhl Planetarium and Institute of Popular Science and Founder of the South Hills Backyard Astronomers amateur astronomy club; permission granted for only non-profit use with credit to author. Special Note --- The Autumnal Equinox also marks the date of a Memorial Service (at Chatham University Eden Hall Farm, Noon to 8:00 p.m. EDT) for Eric G. Canali, who passed-away at the age of 63 on August 31. Coincidentally, August 31 in 1991 was the date of the closing of Pittsburgh's original Buhl Planetarium and Institute of Popular Science (a.k.a. Buhl Science Center) as a public museum. Mr. Canali, an avid amateur astronomer, had made his career at Buhl Planetarium. The Autumnal Equinox, the beginning of the season of Autumn or Fall in the Northern Hemisphere of Earth, begins Friday Afternoon, 2017 September 22 at 4:02 p.m. Eastern Daylight Saving Time (EDT) / 20:02 Coordinated Universal Time (UTC). In Earth's Southern Hemisphere, this marks the astronomical beginning of the season of Spring. On the day of Equinox, the Sun appears directly overhead at local Noon on the Equator. At the moment of Equinox, the Northern and Southern Hemispheres of Earth are illuminated equally. And, the time of Equinox is the only time when the Earth Terminator (dividing line on Earth between daylight and darkness) is perpendicular to the Equator. This, and the reason for seasons on Earth in the first place, is due to the fact that Earth rotates on its axis, which is tilted at an approximate 23.44-degree angle from the plane of the Earth's orbit around the Sun. As the Earth revolves around the Sun, this axial tilt causes one hemisphere of the planet to receive more direct solar radiation during that hemisphere's season of Summer and much less direct solar radiation a half-year later during that hemisphere's season of Winter. As mentioned, during an Equinox (about half-way between Summer and Winter, and about half-way between Winter and Summer) both planetary hemispheres receive an equal amount of solar radiation. Although "Equinox" in Latin means equal-night, the day of the Equinox does not actually have an equal amount of daylight and nightfall, as it appears on the Earth's surface. If the Sun was just a pin-point of light in our sky, as all other stars appear, day and night would be equal. But, because the Sun is a disk, part of the Sun has risen above the horizon before the center of the Sun (which would be the pin-point of light); so there are extra moments of light on the Equinox. Likewise, part of the Sun is still visible, after the center of the Sun has set. Additionally, the refraction of sunlight by our atmosphere causes sunlight to appear above the horizon, before sunrise and after sunset. September 25 will mark the Equilux ("equal-light"), the actual day with equal hours and minutes of the Sun above the horizon, and equal hours and minutes of the Sun below the horizon. The Equilux occurs twice each year, approximately 3-to-4 days before the Vernal Equinox and 3-to-4 days after the Autumnal Equinox. An urban legend that has been making the rounds for decades has it that eggs can be stood on their ends only during an Equinox, whether the Vernal Equinox in the Spring or the Autumnal Equinox in the Fall. This is completely false. Depending greatly on the size and shape of the particular egg, eggs can be stood on their ends any day of the year! Astronomy has nothing to do with whether an egg can stand on its end. If an egg can stand on its end on the Equinox (and, due to the shape and size of some eggs, this is not even possible), it can stand the same way any other day of the year. In the last few years, with the help of the Internet and Social Media, another urban legend has become prevalent. Now it is claimed that brooms can stand, on their own, on their bristles, only on an Equinox day. This is also false. Again, as with eggs, if a broom can stand on its bristles by itself (this usually only works with newer brooms, with more even bristles) on an Equinox, it can do so any day of the year! September 22 is also designated as the annual Falls Prevention Awareness Day for this year. Enhanced color image of Saturn's rings, from NASA's Cassini Space Mission. Launched on 1997 October 15, the Cassini mission will end exactly one month shy of 20 years. The spacecraft entered orbit around Saturn on 2004 July 1, after swinging around Venus, Earth, and Jupiter for gravity-assist maneuvers. Cassini was a joint project of the American space agency, NASA, the European Space Agency (ESA), and the Italian space agency (ASI). It was the fourth space probe to visit Saturn, and the first to enter orbit around Saturn. Carried with the Cassini Spacecraft was the Huygens space probe, an ESA project which landed on Titan, Saturn's largest moon, on 2005 January 14. To date, this is the only landing of a space probe on an object in the Outer Solar System, the only landing on a Moon (other than Earth's Moon), and the furthest from Earth a space probe has landed. After 13 years in orbit of Saturn, following 7 years to travel from Earth to Saturn, the Cassini Spacecraft is now low in rocket fuel, used to adjust its course in orbit. After the discoveries that 2 of Saturn's moons (Enceladus and Titan) have the potential to harbor some type of life (or could develop life sometime in the future), scientists had a difficult decision to make. Once Cassini's fuel is completely depleted, they could no longer control the spacecraft. Hence, there is a possibility that the spacecraft could crash-land on one of those moons. If this happened, Earth microbes, which may be on the spacecraft, could infect the moon's environment. Hence, the decision was made to have the Cassini Spacecraft dive into the clouds of Saturn, which are unlikely to be contaminated with Earth microbes. The NASA / JPL scientists currently predict that, as Cassini dives into the clouds of Saturn, they will lose all radio communication with the spacecraft on Friday Morning, 2017 September 15 at 7:55 a.m. Eastern Daylight Saving Time (EDT) / 11:55 Coordinated Universal Time (UTC). Loss of signal could occur a few minutes later, if drag on the spacecraft caused by the Saturn atmosphere slows down the spacecraft's descent. However, due to the great distance between Earth and Saturn at this time, there is still an 83-minute radio delay. So, whenever the radio signal is lost, the event causing the signal-loss would have actually occurred 83 minutes earlier. Live coverage from NASA and from JPL, streamed live on their Internet web-sites, will occur on Friday, September 15 from 7:00 to 8:30 a.m. EDT / 11:00 to 12:30 UTC. This will be followed by a Cassini post-mission news conference on Friday, September 15 at 9:30 a.m. EDT / 13:30 UTC. There will also be a pre-event question-and-answer session with project scientists and engineers on Thursday Afternoon, September 14 at 4:00 p.m. EDT / 20:00 UTC. "'Our Saturn years'," Cassini's epic journey to the ringed planet, told by the people who helped make it happen." "Cassini Probe Shows Colorful Storm at Saturn's North Pole." 2013 Dec. 5. "Backlit View of Saturn & Rings: Cassini Spacecraft." 2012 Dec. 19. "New, dramatic Saturn video created from Voyager and Cassini spacecraft images." 2012 April 25. NASA's Cassini Spacecraft, now orbiting the Planet Saturn, will end its nearly 20-year mission by diving into Saturn's atmosphere on September 15. "Astronomical Calendar: 2017 August." 2017 Aug. 1.